Hi everyone! I have an easy, quick and fun crochet tutorial for you today! These cream filled biscuits look great and they make great play food toys for kids. You can also add magnets to the back and turn them into fridge magnets. Rnd 2 – Ch 1 (don’t count as stitch). Crochet 2 hdc into each stitch around. Sl st into next stitch. (24). Cut off yarn, leave a long tail for sewing. You need to make 2 of the above for the biscuit. Rnd 2 – Ch 1 (don’t count as stitch). Crochet 2 hdc into each stitch around. Sl st into next stitch. (20). Cut off yarn, leave a long tail for sewing. 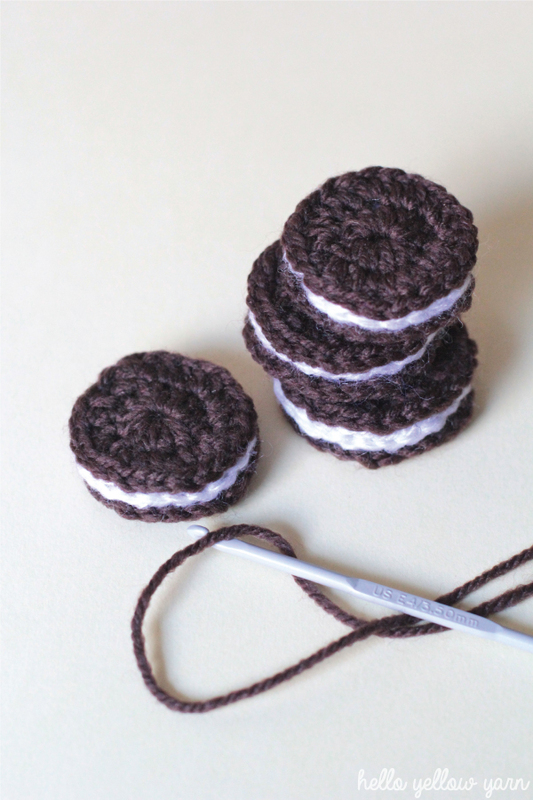 Place cream filling (white yarn) between the two biscuits and using the long yarn tail from the biscuit, thread the yarn through the yarn needle and begin sewing the pieces together. 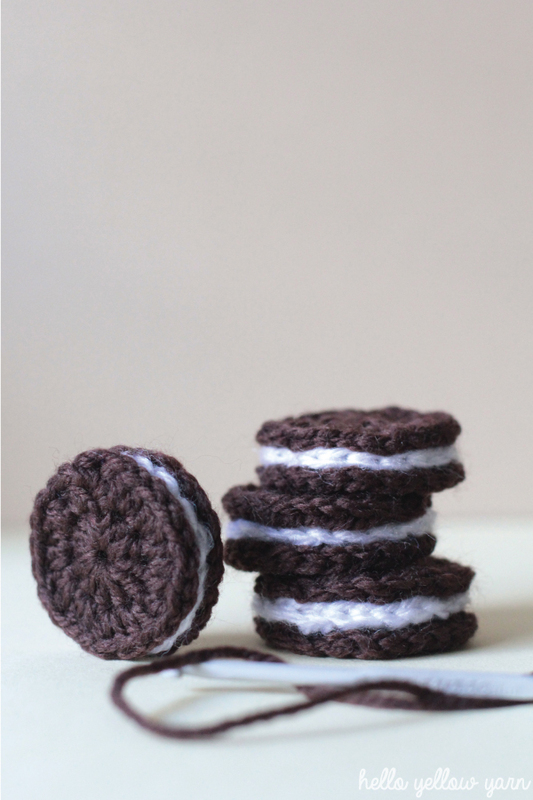 Ensure that you hide the yarn inside the cream filling and sewing just under the stitches. 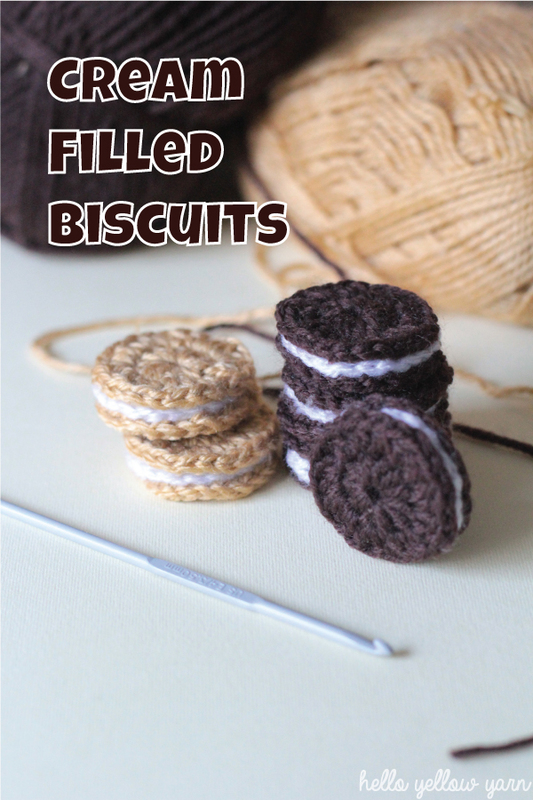 Finally hide the yarn inside the biscuit before you fasten to finish. Make sure to follow my blog to see more tutorials! © 2014 MJ Carlos. Strictly do not copy, sell, alter or re-distribute this pattern in any form. Finished item using this pattern can be sold as long as it is handmade by yourself and credit is given to MJ Carlos/Hello Yellow Yarn for the pattern and design. Images from this pattern (digital & print) are not to be used when selling the finished item. Previous postHello Yellow Yarn is born! Thank for for sharing such cute and easy to follow patterns.